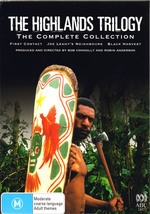 This astonishing documentary series was filmed over a ten year period in the highlands of Papa New Guinea. The series contains 3 DVD's that include First Contact (1983), followed by Joe Leahy’s Neighbours (1989) and Black Harvest (1992) which have won 30 national and international awards, including an Academy Award nomination for First Contact. All three won the Grand Prix at France’s prestigious Festival Cinema du Reel, and AFI awards for Best Documentary. In the 1930's, the Leahy's brothers encountered the hidden people of the highlands in New Guinea that was the first meeting of white and black. This documentary series features some extraordinary archival footage of both cultures and how this meeting between the two different cultures left one culture totally scarred. The series finishes with Black Harvest that is a sad tale of despair and woe with the coffee plantation that was introduced into the highlands causing the downward spiral of the proud people of the highlands. Riveting stuff. For a documentary that is between 20 to 30 years old, the video quality is quite exceptional that is presented in an aspect ratio of 1.33:1 with Dolby Digital 2.0 audio. After viewing this amazing series, one cannot help but ponder feel for the different cultures around the world that have been affected by the West. Highly Recommended!